Murder by Gaslight: The Act of a Mad Man. Mrs. Emma Marrs and her sister-in-law, Ida Marrs, were preparing breakfast the morning of February 13, 1897, in their home at 129 South Upper Street, Lexington, Kentucky. Around 7:45 Mrs. Marrs sent the servant girl upstairs with a bowl of warm water so her husband John could wash up. When she entered the room, John jumped out of bed with such a peculiar expression on his face that she quickly set the water down and hurried out of the room. She was halfway down the stairs when she heard a pistol shot from the bedroom. 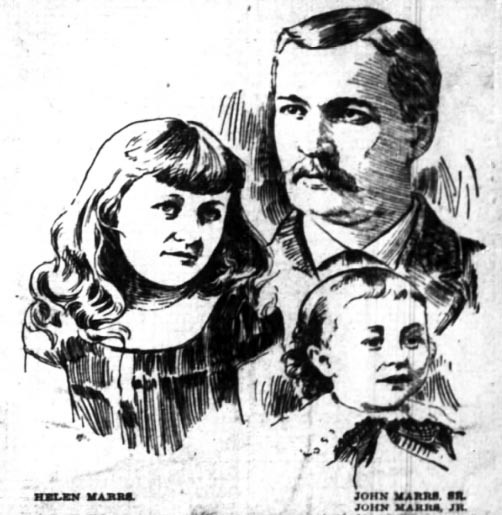 Mr. and Mrs. Marrs and their two children, John Jr., age 5 and Helen age 15, slept in two beds in the same room. John Marrs Sr. had shot his son in the forehead as he lay in bed. The shot startled Helen awake; she saw what had happened and started screaming. John fired two shots at Helen one missed her the other went through her neck. Helen ran from the room as Emma and Ida approached the room. Ida Marrs entered the room just as John Marrs smashed the head of his wounded son with the pistol. He turned the gun on his sister and fired. When the shot missed Ida, he threw the pistol at her head knocking her to the ground. The boy was still crying in pain; Marrs drew as a straight razor and with a wild maniacal laugh cut his son’s throat from ear to ear. He then did the same to his own throat, severing his windpipe and jugular vein. Hearing the gunshots, neighbors forced open the door and rushed in. In the bedroom, now quiet, they found a gruesome scene—the young boy lay on the bed, shot, beaten and slashed. John Marrs lay on the floor in a sea of blood. In the hall, Helen was wounded and unconscious, Ida was in a state of shock and Emma was suffering from nervous prostration. John Marrs had a history of mental illness. At age 22, he was courting Emma Davis and asked for her hand in marriage. When she refused he became infuriated and swore he would kill her if she did not marry him. Marrs was judged insane and committed to the Eastern Kentucky Asylum. After six months the doctors determined him cured and he was released. Emma agreed to marry him, and they settled into a happy marriage. 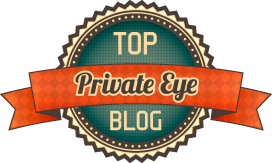 John had a successful career with M. Kaufman & Company, clothiers, and owned a great deal of real estate and interest in several building associations. He belonged to the Knights of Honor and the Odd Fellows and was a deacon at the Central Christian Church. Around Christmas 1896, John was taken violently ill, having peculiar headaches. Since then he had not been in his right mind. He was given to spells of melancholy during which he would discuss suicide. Dr. Joseph Bryan examined John and advised the family to commit him to the asylum again. The Marrs family was one of the oldest and most prominent families in Kentucky. The funeral for John Marrs Sr. and John Marrs Jr. on February 14, filled the Central Christian Church with 1,500 mourners and many more stood outside blocking the streets for blocks. Father and son were buried in the same grave. “Act of a Mad Man,” Denver Post, February 13, 1897. 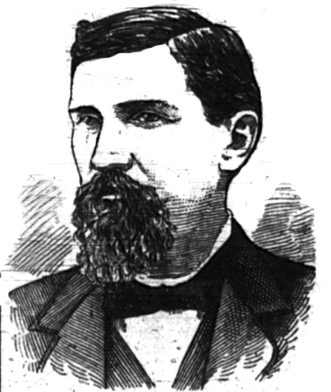 “John Marrs,” Marietta Daily Leader, February 15, 1897. “John Marrs,” News-Herald, February 18, 1897. “Laughed,” The Cincinnati Enquirer, February 14, 1897. “Tragedy In Kentucky,” Jackson Citizen, February 16, 1897. A heinous evil murder... the address of 129 S Upper Street seems to have been demolished...the street still exists and is near the University of Kentucky. Webpages for both the Murderer and the young boy are on Find A Grave, here is the link for the boy: https://www.findagrave.com/memorial/97263454/john-marrs May the murderer burn in Hell for eternity. Dr. William Marrs, who was run over in the C. S. yards Thursday night, died from the results of his injuries. Coroner Molloy is holding an inquest this afternoon which may result in a sensation when the facts are discovered. A few weeks ago Dr. William Marrs, well known in this city, was found in the C.S. Yards with terrible injuries inflicted, it was claimed, by being run down by a switch engine. He died shortly afterward in the hospital.